I am still feeling pretty excited about next weekends’ race, fingers crossed I don’t go crazy during the taper and turn into a ball of nerves. I plan to go into this race ready to conquer it. A lot of planning is involved in gearing up to run a long distance race, including volume of running, nutrition, race day clothing, warm-up, fuel, and best of all, the post-race celebration! Running: I have about 43km of running total to do between now and the marathon next Sunday, not much considering my total weekend mileage is often around that. The longest remaining run is a mere 13km. Considering I ran about 100km last week, the 2 weeks pre-race involve a significant decrease in running volume. The goal is for the legs to have a chance to recover from all the training and be ready to hold marathon pace throughout the race. Nutrition: I have been extra hungry these last few days, not too sure why, it’s almost as though my body knows it will need all the healthy food it can get in preparation for this race. I am making sure I give my body what it needs and if I am hungry, it means I eat, but I always make sure I’m getting enough carbs, protein and fat, not too much of one macronutrient and too little of another. For running, carbs are and will always be king, but protein and fat can’t be neglected. For dinner, pre-race, I will likely have pasta, cliche I know, but it works. I will either have some form of protein in the pasta or on the side. For breakfast, I will have hot oatmeal, gotta stick to your regular foods so you know your body will react well. Race Outfit: As of now, the weather report is saying it will be 14 degrees on race day. There is still ample time for that to change of course. I think I will bring two options: a singlet and split leg shorts, and a t-shirt and crops. I will be forgoing the hat for fear of how long the forehead dent would remain after running 3+ hrs with a hat on. The non-negotiables are my Saucony Hurricane Iso 2’s, Flip Belt (best running accessory ever) and my Garmin (duh). Pre-race Warm-up: Typically, I warm-up for 15-20 minutes before running a race. This is true for distances beginning at 5km all the way up to half-marathons. The marathon distance will be the exception, my warm-up with be a measly 5 minutes, so as not to use up energy needed for the race. Fuel: What I will be taking throughout the race is an energy gel called Endurance Tap, they are just sachets of maple syrup and I plan on fuelling every 30 minutes. Fuelling this often really helps me continue to feel great, I recommend trying it. Since I will be taking at least 6 gels, my one concern is that I might get sick of taking so many of these maple ones. I am still deciding whether I want to alternate them with another gel that I have also trained with. Post-Race: My first wish is to be able to walk. Aside from that, I am sure I will be ready to eat something large and not ingest anymore gels. I also imagine I will be looking forward to a long, hot shower or bath (if I can’t stand). Following that, I am planning to meet up with some fellow EVRC folks to celebrate over a craft beverage or two at my favourite beer bar in Victoria, The Drake. What do you do in the days leading up to a race to prepare? Monday: I was supposed to do my last long run of 2.5 hrs and I fully intended to, however I realized after getting dressed, that I had nowhere to put my gels. My fuel band was forgotten at home and I was in Victoria. There were not ample pockets in my running clothes so, I forgoed the long run and switched it for another run on the schedule. 60 minutes easy from Vic West to Dallas Rd and back, I was feeling super energized and though I wasn’t supposed to, ran the hour at marathon pace. I also did the NTC Gracie Gold core workout and an NTC yoga class. Tuesday: No more delaying it, time to get that last long run over with. 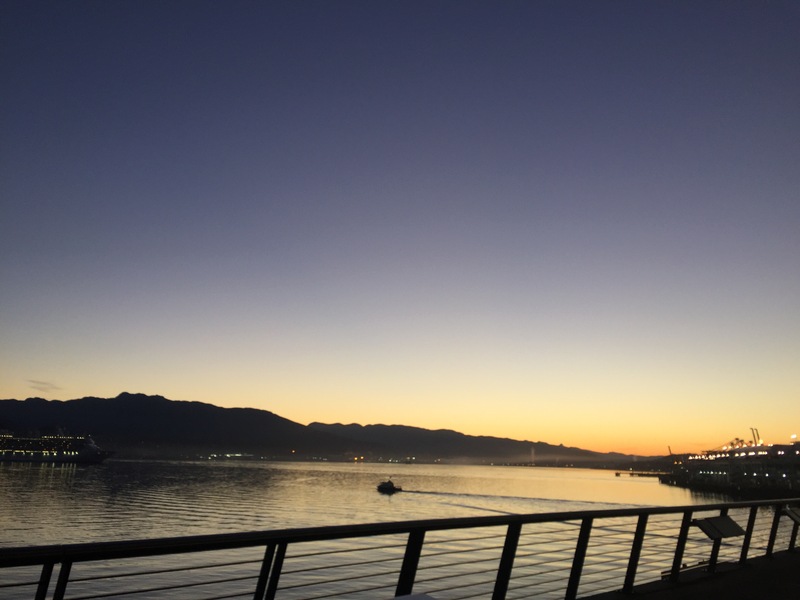 I had company from 2 people at work so that was awesome, and it was a beautiful night on the Seawall. We did the whole loop and then headed out to false creek and past Science World towards the Burrard Bridge which we crossed and then took Pacific back to Howe and back to the shop. It was a pretty good run! I also did the NTC Abs and Arms workout. Wednesday: We had a run scheduled with the Sport Chek Robson Training Club and the consensus was to do an easy/recovery run. We headed out for 8km down to Devonian Harbour Park and then through Stanley Park a bit and then took the Seawall back to the shop. Thursday: Long interval workout starting with a 20 minute warm-up, followed by 30 minutes @ 5:15, 15 minutes @ 5:05, 10 minutes @ 4:50 and then 20 minutes to cool-down. Friday: OFF. My friends were set to arrive from Manning Park at 5am, after completing the entire Pacific Crest Trail on a 5 month hike, that’s about 2600 miles FYI. Saturday: Intervals at marathon pace, 20 min warm-up, 4 x 15 mins @ marathon pace, 20 min cool-down, this felt great and I went fast than marathon pace during the intervals. Sunday: 90 mins “easy” I just went along th good ole Seawall for an out and back route. 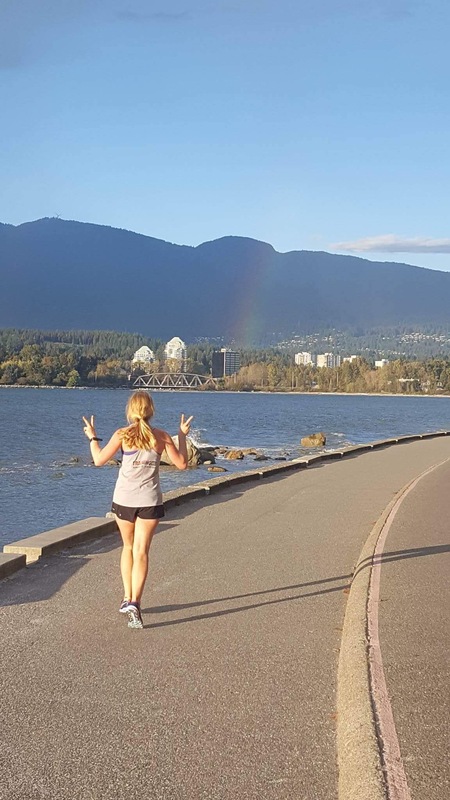 This is a photo from my final long run, note the rainbow, how perfect! 2) This ADIDAS bomber jacket. I picked it up on Friday from Sport Chek, and I can’t stop wearing it. It’s perfect for the fall, when it’s not yet raining all the time. 3) Finally running my first marathon! I feel good going into it (thus far) and I have my heart set on running Boston in the future, so I am excited to experience the roller coaster that I believe marathon running is. It will give me an idea of where I am in my training and what I need to do to BQ. 4) This book! I am a running/ shoe-nerd and I love memoirs/biography’s so this is the perfect read for me. I just finished Amy Schumer’s The Girl with the Lower Back Tattoo, and while this book will inevitably have a different tone, I am excited to read it. 5) My best friend from middle/high school/ undergrad will be here this weekend! She has been hiking The PCT since April, yes, April. She is finishing up the last bit of hike which will end in BC, Canada, and then catching a bus to Vancouver. I can’t wait to see her and hear all about her adventures. Monday: OFF, I definitely needed this after Sunday’s hilly trail run. I did do my strength training circuit and some core work though. Tuesday: 45 minutes “easy”, I also did core work. Wednesday: double run day! I did 30 minutes “easy” in the morning and then 60 minutes “easy” in the evening with The Sport Chek Training Club. The total for the day was 17km. Thursday: My workout was 30 mins easy, followed by 5 x 1 mile @ 10km pace, and then 20 mins easy. I was dreading this speed workout because I don’t normally do mile long intervals and they seemed pretty intimidating, but once it was done I felt great, as always seems to be the case after completing a challenging workout. Saturday: I had the Eastside 10km race, and it was pouring rain. I ran from my place to the start line as part of my 20 minute warm-up. Fortunately, the other members of The Sport Chek Robson Training Club also racing and I were able to warm-up inside an empty parking garage to stay dry a bit longer! Going into this race I was not sure what to expect, I had a big workout on Thursday and had planned to just run the race at a hard effort as my Saturday workout. I didn’t expect anything from myself due to being in the middle of marathon training. I was pleasantly surprised at how good I felt when the race started. I made the rookie mistake of starting too fast, I was ahead of the 40 min pace bunny for a bit and then realized and corrected my pace. My first km was 4:23 because of that speedy start. My goal was to aim for a 4:30-35 pace throughout the race. There are quite a few hills on this course, but for whatever reason they were not a problem and I felt strong going up every single one. My second km was 4:36, which was more reasonable. The following km’s were as follows: 4:31 4:29 4:35 4:25 4:27 4:30 4:21 4:14. It didn’t even feel like I had to be looking at my watch constantly to make sure I was hitting my pace, it was almost natural. I was super happy with how I felt during the course of this race. I finished at 44:28, which is a new PB for me, previous to that my time was 45:12 from West Van Run. After the race, I went back through the last few hundred metres of the course to see the ladies from The Sport Chek Training Club cross the finish line. Everyone surpassed their time goals and it was awesome to see 2 of the members complete their very first 10km race! I finished off with 30 min easy along False Creek in the rain for a grand total of 19km. Sunday: Off. This was supposed to be my last long run of 2.5 hrs, but I took the ferry to Victoria right after my race and went to Rifflandia music festival, staying up far past my grandma bed-time. It’s good to have some fun once in a while 😉 So, I pushed my long run till tomorrow and will be doing part of the Victoria Marathon course. About 2 weeks ago I was asked if I would be interested in modelling for some ads for Sport Chek. While I do work for Sport Chek, the offer came from the PR company Sport Chek uses. I was told I would be modelling parkas for the upcoming winter ads and that it would be a few hours in duration and I would be compensated for my time. I thought, why not? I woke up before my alarm due to being anxious that I wouldn’t wake-up. I ate breakfast, got dressed in the outfit I had selected: dark jeans and a purple plaid shirt and headed over to the location of the shoot- Canada Place. I had no idea what to expect, or how many people to be looking for. I arrived and saw 2 people standing at the location, the photographer and another model, who I sometimes “run in the same circles” with (see what I did there?). We were given a parka and boots and asked to pick winter accessories to go with it: a toque and mittens. After that it was time to start shooting. 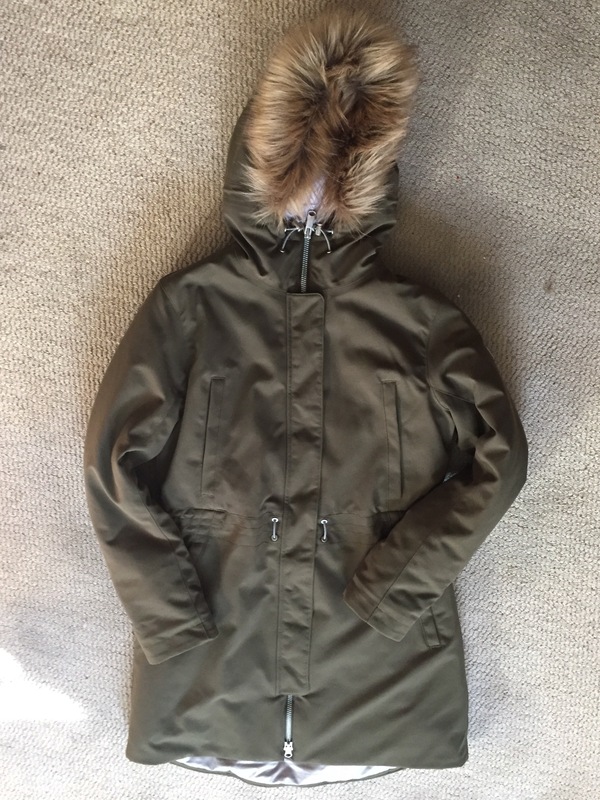 I started with a knee-length Helly Hanson Parka, it was green and had a nice tapered waist for a feminine feel. 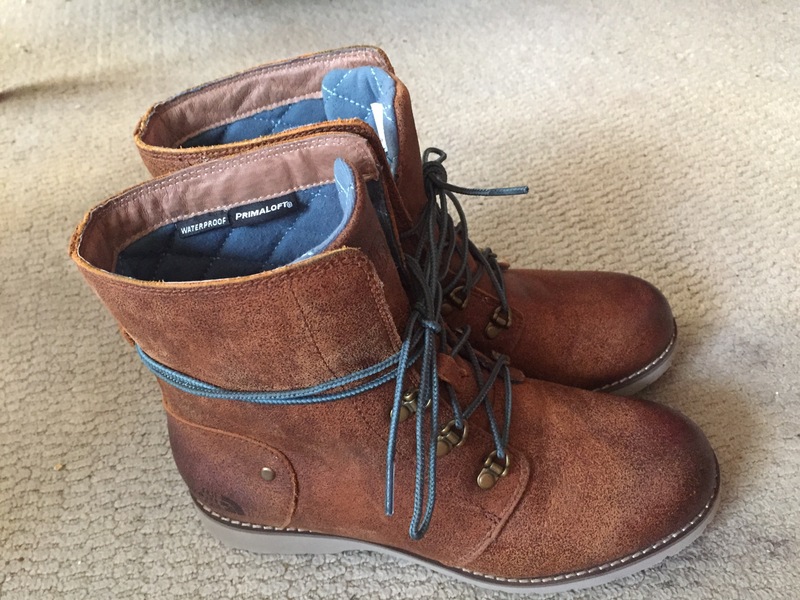 I wore the boots shown above and thought they were pretty stylish winter boots. They are lined and also waterproof which is essential for a Vancouver winter, though they are suitable for snow too. I think they would look great with a chunky sweater and leggings or jeans. We set up near the water so the sun would be rising in the background over East Van. The first part of the shoot was us walking together and then separately towards the photographer. Easy enough! He would tell us whether we needed to smile, look up or down and pretend to have a conversation by saying “shayshayshay…” because that is the magic word that allows your mouth to never look contorted. The concept behind the shoot is a to and from gym look, so we were also carrying ADIDAS gym bags and the location was such that we were walking towards a gym. The next series of shots was closer to the gym. All we had to do was walk slowly towards the photographer and follow similar instructions as before. We also changed our outfits here, parka 2 and hat 2. 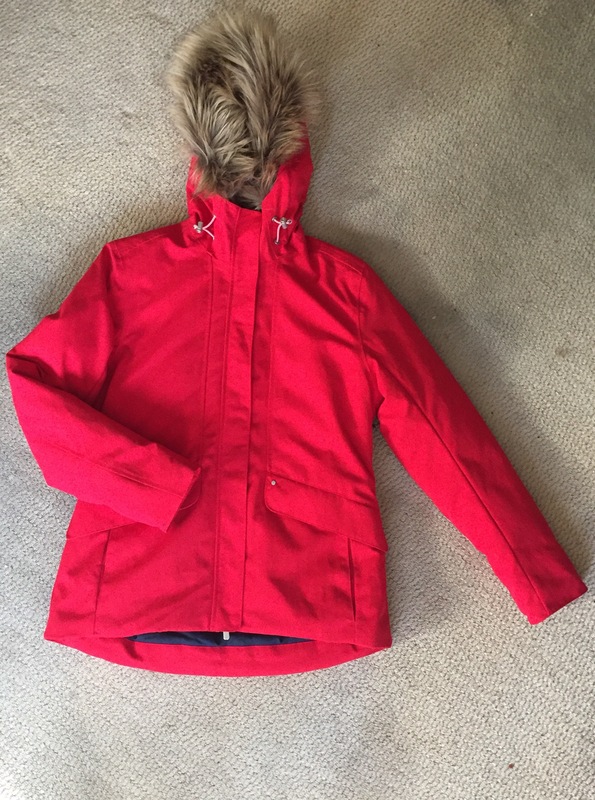 My second parka was also Helly Hanson, this time it was hip length and a bright red colour. I don’t often choose red for myself, but I really liked the bold colour of this jacket and the extra pockets to stash my keys, wallet and phone. The series of shots that followed that was on a set of stairs by the gym, we took some shots walking down the stairs. Following that, we did some brief video footage about first opinions of the parkas and then headed up the stairs for some final shots. I was pleasantly surprised at how relaxed this was and not at all intimidating. We received great direction from the photographer, who was also really good at entertaining us and making us laugh. This made for a great and comfortable environment for the shoot. I had a great time and would definitely be up for doing it again should the opportunity arise. *This post is sponsored by Sport Chek, but all opinions are my own. The original marathon I planned to run was yesterday! I am still feeling good about my decision to wait an extra month and run The Victoria Marathon instead of The Queen City Marathon in Regina. There are many other destination races I would prefer to do including Run the Strip at Night in November, this race is in Vegas. Vegas>Regina! Monday: OFF. I did my regular body-weight exercises circuit and the NTC Gracie Gold Core Control Workout. 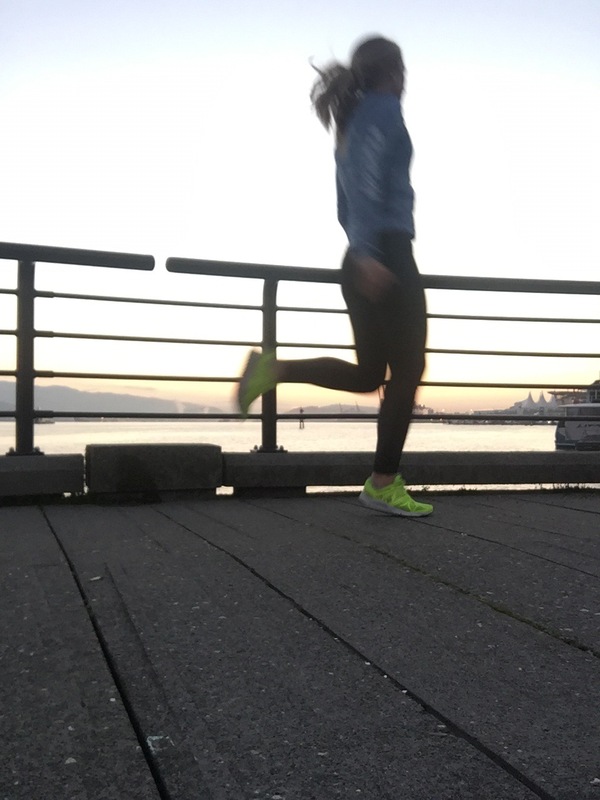 Tuesday: 40 mins/ 7km “easy”, took an old short run route through East Van, maybe I should switch up my routes more often, but it’s hard to beat The Seawall. I also did the NTC Basic Burner core workout for the first time, it was pretty good minus some weird arm reminiscent of the YMCA dance. Wednesday: 20 min warm-up, 2 x 10 min @ marathon pace, 3 x 6 min at half-marathon pace, 2 x 3 min @ 10k pace, 20 min cool-down. This was a great workout, I liked the little bit of speed at the end to remind my legs they still can go fast in spite of all the distance work. Thursday: OFF. I did the NTC Core Crunch 2.0 workout and I my regular body-weight exercises circuit. Friday: I decided to do my big workout scheduled for Saturday a day early. I wanted to indulge in sour beer for my birthday that evening and didn’t want it to impact an important run. I did 45 mins easy, followed by 30 mins at a pace 5 seconds slower than marathon pace, then 25 mins at marathon pace, and 15 mins at a pace 5 seconds faster than marathon pace. I was pleased with how this workout went and spent the rest of the day relaxing and treated myself to a manicure and facial at The Ten Spot. Saturday: 50 mins/ 9km “easy”, just along false creek to Sunset Beach. This was a very pleasant and relaxing run. 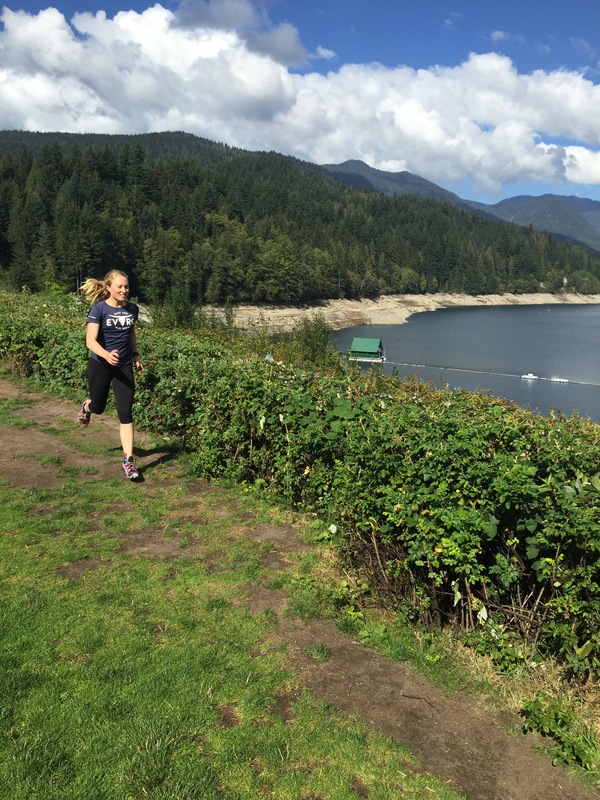 Sunday: 90 mins “easy”, headed to The North Shore for a trail run with Paige. I told her it would be an easy trail run, oops, it wasn’t. We parked at Park Royal and took the Capilano River Trail to The Cleveland Dam. While I wouldn’t call this a technical trail, there are a lot of hills! My quads were on fire, but the scenery and view at the dam made it all worthwhile, plus I had great company! 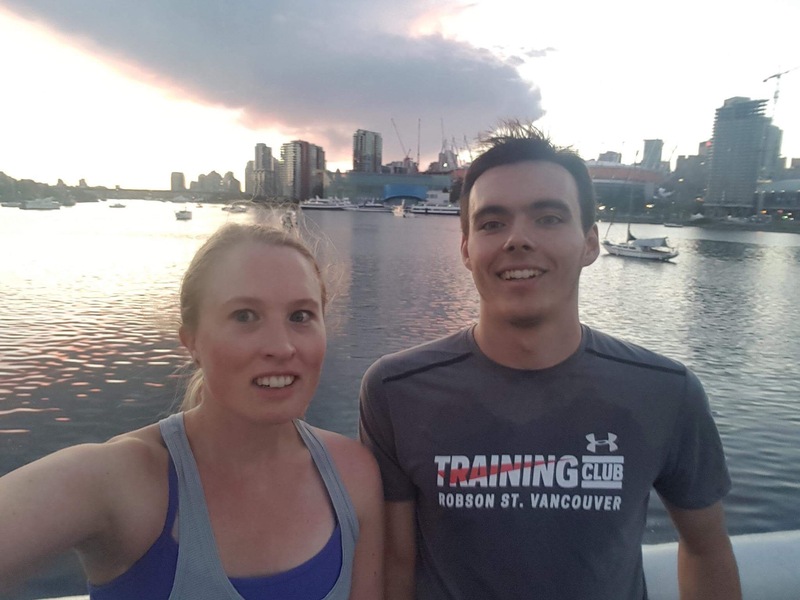 Lots is happening this week beginning with running with The Sport Chek Robson Training Club after a week off, a charity running event, The Eastside 10km race on Saturday and an exciting project mid-week I’ll talk more about next time! The big day is only a month away now! I must say, I am feeling pretty excited to finally join the marathon club. It is something I have wanted to do for a long time, but I wasn’t ready. Am I ready now? I guess time will tell, but as it stands I am feeling pretty freaking good going into this. Before my marathon training started I had envisioned it as being a lot more challenging than it has been, say 30+ km runs every weekend and spending the rest of the day vertical, doing nothing. I also thought I would be insanely hungry all the time, but this also isn’t the case, maybe because I already am hungry most of the time?Obviously, these were some naive assumptions because running that long of a long run every week would be pretty damaging to the body and if you eat properly before, during and after a run, hunger is no big deal. I think for me, the key to feeling great during the race will be to fuel often. 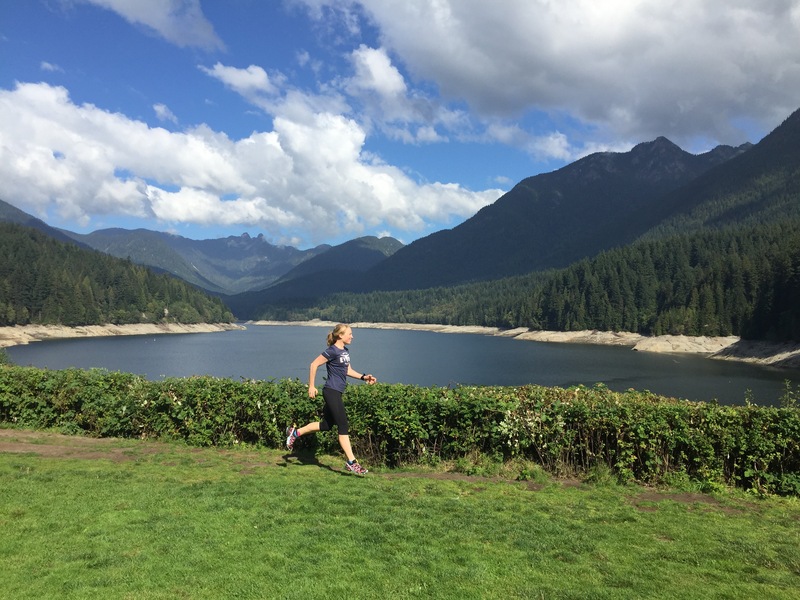 I recently tested this during VanRace which you can read about here:Training August 22-28 and VanRace Recap . I have found that fuel intake should never be underestimated. The other realization that my training has provided is the importance of choosing your run clothes carefully and ALWAYS using BodyGlide. I used to only use glide when I was running with shorts because sometimes the seams cause chaffing and let me tell you, that burning feeling never gets easier. I like to use glide in the area between the arm pit and top of the sports bra on my sides because during long runs, I often get chaffing there, but with glide this is totally avoided! Another important aspect is eating foods you 100% know you react well to. For breakfast before a run, I normally have oatmeal and top it with a banana and unsweetened coconut flakes. If it’s going to be a longer run, I will add a banana. After I am done running, I like to have some form of eggs to re-fuel, last weekend was home-made huevos rancheros, during the week it has been soft-boiled eggs with toast. It is integral to have a breakfast routine to avoid stomach issues on race day, and I have unfortunately had a few stomach issues this training cycle. I think eating at home the night before a run is the best option. That being said, a lot of great races are out of town, even out of the country, so it isn’t always possible to eat at home. I think eating something simple, that you often have, is the best choice. The last lesson I have learned so far is to put in the work and trust the process. I have been doing my absolute best to follow a training schedule made specifically for me, I made sure to fit in my runs on vacation, when friends from Toronto were visiting, and in spite of any other excuse someone might have to not run. The truth is, I actually don’t like to miss runs or take unscheduled days off. It makes it hard for me to sleep and I have this sense of not having used enough energy that day or something. With an average of 1 day off per week, it is manageable, but it will be interesting to see how my final two weeks of training/tapering play out! Any tips on managing excess energy are welcome! What has marathon training taught you? Is there any advice you have for a first timer? So this last week was a lot less mileage than the previous weeks due to an unfortunate incident that happened last Monday. 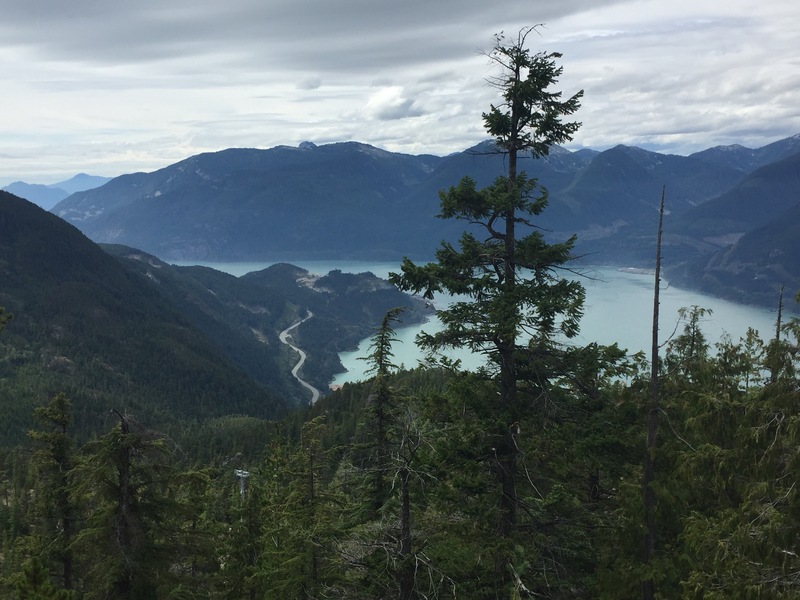 It was my friend Jess’ last day visiting and we decided to go to The Sea to Sky Gondola for the day. We took the bus there and ride the gondola to the top, which I had never done previously. It is definitely worth doing because the views are spectacular! There is a wooden balcony where you have a panoramic view of the mountains and water, and also a suspension bridge that offers amazing views too. Once you cross the suspension bridge there is a short trail you can follow to get different mountain views, we did that and took 1,000 photos and then stopped for a picnic lunch with a view. We knew there were a few other places to walk around and decided to one that boasts a view of The Chief, which I hiked a few weeks ago. This was definitely not a hike, it was more or less a gravel path, but it did not disappoint with the views and scenery. I don’t think there could ever be a “bad” view in Squamish. There was still time left after we completed this path, so we decided to try another one. It was rated as easy and we were interested to see what alternate views it had to offer so off we went. About 1 minute into this trail, I was going over some roots, ahead of Jess, and all of the sudden I was on the ground. I was covered in dirt and my left ankle HURT. Jess started laughing because she has a knee injury and we were joking that I would have to drag her out of the trail…not the case! I hobbled my way out and fortunately had an ice pack from our picnic I used to soothe my ankle. By the time we got home it was the size of an apple, so needless to say I was out of commission for a few days. Tuesday: OFF, NTC Jeanette Jenkins, Hollywood Ab Blast, it was hard! Wednesday: OFF, NTC Serena Williama, Core Power and a strength training circuit with no lower body weight bearing exercises. I biked alongside The Sport Chek Robson Training Club. Thursday: I did the 30 second hop test to see if my ankle was okay for an easy run, no pain, so I set out for 40 mins easy. I also did a yoga for runners 20 minute practice at night. Friday: 75 mins easy, mostly with The Sport Chek Robson Training Club. Saturday: I did the workout originally schedule for Wednesday which was: 20 mins easy warm-up, 4 x 15 mins @ marathon pace, 20 mins easy to cool-down. Sunday: My long run was 2 hrs which was a bit shorter than it has been these past few weeks, I went a few minutes shorter for a total of 20km and it felt hard! I have been very fortunate this summer to have been given multiple pairs of running shoes. I have previously written Shoe Review: Under Armour Gemini 2 and Shoe Review: Adidas Ultra Boost Uncaged . I got lucky again and received these shoes last week from the Saucony shoe fairy (Thanks Rebecca!). I have been running in many different brands of running shoes since last fall, but last summer I ONLY wore Kinvara’s for all of my runs and training. I went through 1 pair of Kinvara 5’s and 2 pairs of Kinvara 6’s. There have been some important upgrades between the 6 and the 7 including the addition of the Everun heel insert, which is Saucony’s new cushioning. It is closer to the foot, directly under the sockliner (insole). 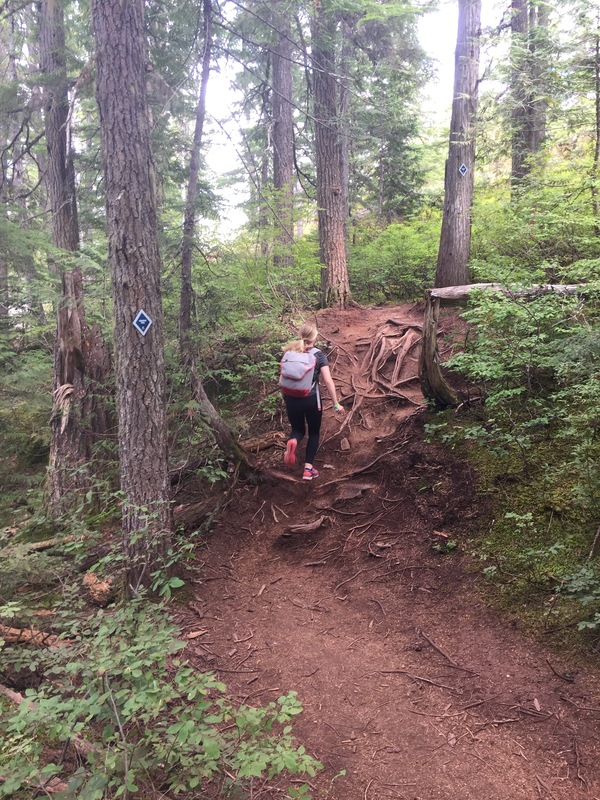 I had not run since my 30km at VanRace on Sunday because I had a fall while hiking on Monday and twisted my ankle, so today was my first day back! I took these out for an easy 40 min run which was 6.6 km. These are the lightest performance shoes in my rotation, but the comfort is not compromised at all. They are responsive and still feel cushioned. Kinvara’s are what I would typically use when doing speed work or racing shorter distances, when I want to feel light and fast, though I have done half-marathons in them too. I rotate my running shoes depending on the run for the day and I am also using The Saucony Hurricane ISO 2 specifically for my longer runs. The Kinvara 7 is a more natural ride at a 4mm drop and is classified as a neutral shoe. This allows the body and feet to take on a greater work load as compared to wearing a cushioned stability shoe like the Hurricane. Aesthetically, I love these shoes! This is a new colourway, brought in for me, but there are 4 other choices available. I really like that the sole is blue instead of white like many other Saucony shoes. Saucony is a performance brand that solely focuses on running, their shoes work great for me and I would recommend them to anyone who is serious about running. The Kinvara 7’s are sure to be my new favourite lightweight, neutral shoe and I would give them a 5/5.